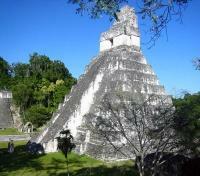 Private guided tours of stunning archaeological sites Tikal and Uaxactun. 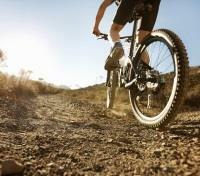 Bike the scenic Antigua Valley with private guide. Kayak Lake Atitlan, and zip-line Atitlan Nature Reserve. 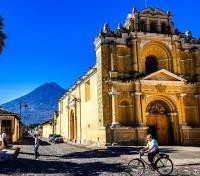 Discover charming Spanish colonial architecture with private guide in Antigua. Embark on a well-balanced Guatemalan discovery, with private-guided adventure, great food, amazing archaeology, and charming cities. This is the true Guatemala experience. After a night in the nation capital, Guatemala City, head to the beautiful shores of Lake Atitlan for a taste of adventure. Set out with a private guide and zip-line through the picturesque Atitlan Natural Reserve, with canyons, waterfalls, and coffee plantations in full view. Kayak and hike along the magnificent Lake Atitlan coast, with towering volcanoes all around you. In Antigua, participate in an artisanal chocolate workshop, and stroll around the Spanish colonial old town with your private guide. Cycle past farms and small villages in the Antigua Valley, then continue to the sacred ancient Mayan site of Tikal, a UNESCO World Heritage site, your knowledgeable private guide. Classic Guatemala at its finest. For your added comfort, an English-speaking guide will be waiting outside of Customs holding a sign with your name on it. Your guide will bring you to your waiting private driver and vehicle, and will accompany you to your hotel to assist with check-in. This transfer will take approximately 40 minutes. Upon arrival to your hotel, you will receive a welcome kit which will include a Kensington Tours tote bag, a detailed itinerary of your tour, a map of the country, any additional travel information you may require, and a local trinket. 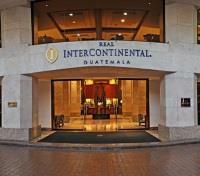 Located in Zona Viva, the heart of Guatemala’s entertainment and business district, the Real InterContinental Hotel provides guests with modern amenities and comforts in this historic city. The hotel features a gastronomic center with four unique concept restaurants, a vibrant bar, a fitness center and a spa. Every room has been designed to ensure a positive experience, with streaming speed internet service, soundproof windows, ergonomic mattresses, Egyptian cotton sheets and more. Meet your professional driver for a private transfer to Lake Atitlan in the Guatemalan highlands. Total travel time will be approximately 3 hours. To begin your zip-line adventure, a private driver will transfer you via tuk-tuk to the Atitlan Natural Reserve. 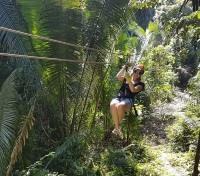 After climbing part of the mountain (roughly 300 feet), you will then fly down across the forest on a series of eight high-speed zip-lines. With incredible views of the lake as you pass by canyons, waterfalls and coffee plantations, this scenic tour is a favorite among travelers. After the zip-line tour, your driver will return you to your hotel. This service includes transportation, guide, and entrance fees. 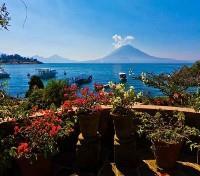 Hotel Atitlan is one of Guatemala’s finest and most charming boutique hotels. 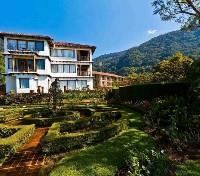 The hotel is situated 10 minutes from the main town of Panajachel on what once was the estate of a family owned coffee plantation, now a lush botanical garden. The decorations are beautiful, with hand-carved wooden furnishings blending exceptionally well with ornate ceramic tiles. 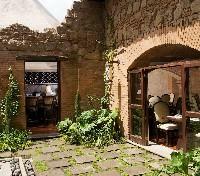 It is wonderfully decorated with wood hand-carved furnishing combined with ornate ceramic tiles. 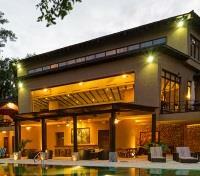 The design and décor reflect the elegant Spanish colonial style of an 18th century Guatemalan plantation. Floors are made from traditional tile and covered with beautifully hand-woven area rugs. Hotel Atitlan is designed to be a relaxing home away from home for discriminating travelers in search of a truly unique experience. After breakfast, your guide will take you, via private boat, to Santa Cruz where kayaks and gear for your lake experience will be waiting. Once outfitted, participate in an easy 45 minute to one-hour kayak tour along the shores of Lake Atitlan, paddling past small indigenous villages, local fisherman and rugged cliffs with exotic plants and birdlife. Upon arrival to the small village of Tzununa, you will embark on an easy hike along footpaths used by locals, each offering stunning views of the volcanoes surrounding the lake. After the hike, you will be returned to your hotel by boat to enjoy the rest of the day at leisure. This service includes transportation, guide, kayaks, and entrance fees. 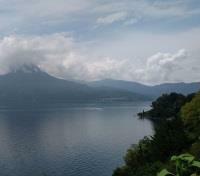 You will be privately transferred from Lake Atitlan to Antigua with a bilingual driver. This transfer will take approximately 3 hours. The word cacao originates from the Maya word ka'kau' and they believed that it was discovered by the gods in a faraway mountain. Around 900 AD, the Mayans determined that these beans could be crushed and turned into a bitter though intoxicating liquid. 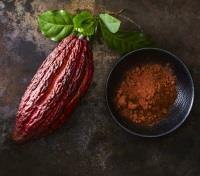 From this original drink which also included chili peppers and corn meal (the Mayan’s did not have sugar), myriad chocolate treats have been created. In a small chocolate factory located in San Juan El Obispo, a family still produces handcrafted chocolates using age-old Mayan techniques passed down through the generations. Here you will learn about the ancient techniques for preparing Mayan chocolate and sample a few of these delights before returning to your hotel. This service includes transportation, guide, and entrance fees. Located on a cobblestone street across from the legendary Capuchinas Convent, El Convento Boutique Hotel welcomes visitors to an oasis of elegance and comfort. Each of the 26 spacious, exquisitely decorated suites draw upon the history and culture of this famous city, creating an intoxicating blend of traditional simplicity and modern convenience. Placing all of Antigua’s most captivating landmarks and activities right at your doorstep, El Convento Boutique Hotel was awarded the Most Excellent Hotel in Mexico and Central America by Conde Nast Johansens in 2013 as well as TripAdvisor’s 2013 Traveler’s Choice award. 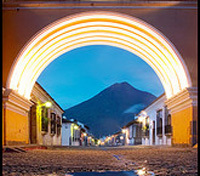 Antigua is one of the best-preserved colonial cities in the Americas. A captivating town, it feels as though time stopped here 300 years ago. On this walking tour you will visit the Central Plaza and discover the main Spanish-Baroque influenced buildings in the town which include El Portal, Palacio de Capitanes, and Antigua Cathedral. Carrying onward, the tour will take you through the locally-popular Tanque La Union, the San Francisco Church (used in the 1935 classic film, The New Adventures of Tarzan), the picturesque 5th Avenue and will conclude at La Merced, a baroque church founded in 1767. This service includes a bilingual guide as well as entrance fees. The Almolonga Valley is where the second Capital of Guatemala was settled. The city met a fateful end in 1541 when a catastrophic mudslide released from the crater of Agua Volcano destroyed the town. Nothing remained of the city, and there is much debate as to where it was originally located. After transferring to the valley via tuk-tuk, the starting point of this tour, you will see ruins one earthquake away from extinction, visit the San Lorenzo macadamia farm & explore the villages of Santiago Zamora and San Antonio Aguas Calientes, famous for their textiles and weavings. 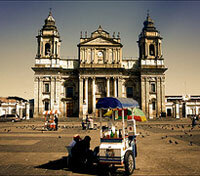 Enjoy a private, one hour transfer from your accommodation in Antigua to Guatemala City. Travel time will vary based on local traffic conditions, and can take up to 1.5 hours when experiencing heavier traffic. Board a flight in Guatemala City with service to Flores, Peten - gateway to the most spectacular Mayan ruins in Guatemala. Flight duration is approximately one hour. Enjoy a private airport transfer with vehicle and driver. Travel time is approximately 30 minutes. Located in the ancient heart of the Mayan world, near the ruins of Tikal, Uaxactún and Yaxhá, Las Lagunas Boutique Hotel invites guests to relax in a superbly tailored jungle setting. With more than 300 acres of private property to explore, a range of local and international cuisine available on-site, and set on the ever-beautiful Quexil Lagoon, Las Lagunas Boutique Hotel is the ideal property to relax in while immersing yourself in the culture of Peten. In addition to private trails, four private lagoons beyond Quexil and Shultun restaurant, hotel amenities include room and laundry services, wireless internet (hotel lobby only), tours of the surrounding nature trails, and bicycle or kayak rentals. 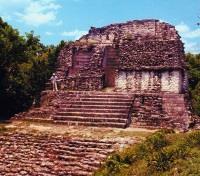 Uaxactun Archaeological Park is located close to Tikal and is surrounded by dense tropical rain forest. In addition to its natural beauty, the park is home to an ancient city. This city was an important hub of artistic design during the pre-classical Period (2000 BC – 250 AD). While touring the Astronomical Observation Complex found in Uaxactun, you will learn about the important conclusions reached by these ancient stargazers, and discover how relevant these findings were to Mayan ceremonies and rituals throughout the centuries. Tikal National Park, one of the largest Maya archeological sites, will be revealed to you on a fascinating and privately guided tour. Once home to an incredibly powerful ancient Maya kingdom, your expert guide will provide insights into this ancient metropolis which features monuments from as far back as 4 BCE. The city would not reach its peak Classic Period, and the incredible buildings, history, and widely recognized theories of the collapse of the Mayan civilization we be explained to you in detail during this excursion. 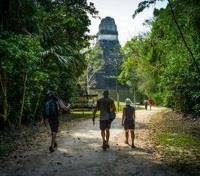 After the tour, enjoy lunch at in Tikal National Park before being transferred to back to your hotel. 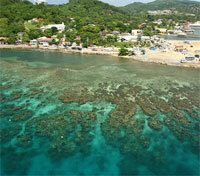 You will be privately transferred to Mundo Maya Airport in Flores alongside a professional driver. Approximate transfer time is one hour. Your flight from Flores, Peten to Guatemala City (included) will last approximately one hour. Enjoy a private airport transfer with vehicle and driver. This transfer will take approximately 40 minutes.